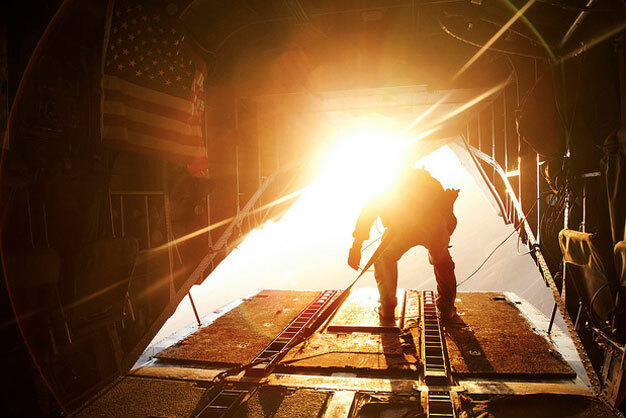 A U.S. Marine CH-56E Super Stallion crew chief assigned to Marine Heavy Helicopter Squadron 361, Marine Aircraft Group 16, 3rd Marine Aircraft Wing, makes his way to the ramp while flying over Helmand province, Afghanistan, Nov. 13, 2012. HMH-361 is deployed in support of Operation Enduring Freedom. U.S. Marine Corps photo by Cpl. Alejandro Pena.